Today has been a soggy day of sightseeing. 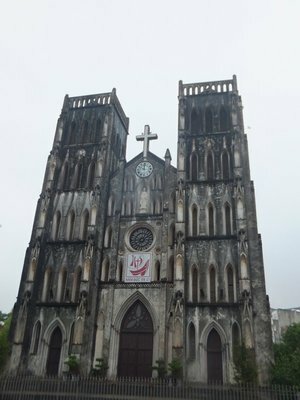 We got up nice and early to find Hanoi was overcast with stormy skies and heavy rain. We got ready and stayed inside hoping it would clear. By 11am it still had not cleared and we were eager to get out so we put on our rain coats and braved the rain. We walked through the back streets and went into a small cafe for a morning coffee. Vietnamese coffee is very strong and sweet as they put condensed milk in it and it was delicious. After half an hour in a cafe we went in search of some brunch. We had previously read about these sandwiches with pâté and different meats and we spotted on in a small alley. It is called Banh My Pâté and we weren't really sure what to order as there was a cooler full of different things. We just asked for two and the lady said 'meat' and we said yes. She then said 'everything' and we obviously said yes. She warmed up some bread in her street side oven and then fried an egg in a pan. She added pâté to the pan and let it cook. 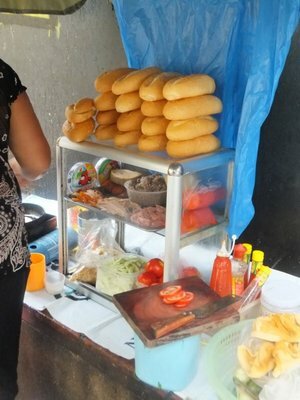 She then filled the warm baguette with three types of meats and salad and added the cooked egg. It was yummy and really tasty, a great brunch meal which we ate in shelter from the rain under a shops tarpaulin. 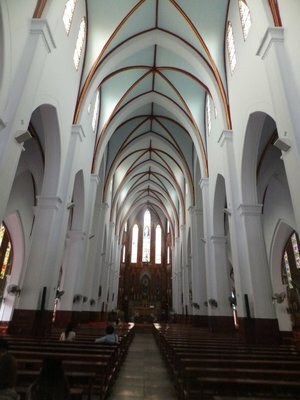 We then headed for St Joseph's Cathedral as we thought it would be worth a visit but it was closed until 2pm. We decided then to walk to the train station and have a wander around the french district which according to our guide book is in that area. The walk to the station was quite long and very wet as it poured with rain the whole time. The streets are mental, continually full of traffic weaving in and out and beeping their horns. All the paths are filled with parked motorbikes so you have to walk on the road and the pavement is uneven and muddy. When we arrived at the station there was a queuing system like Argos. You took a ticket with a number and waited to be called. It soon became apparent that no one gave a flying frig about the system and it was just a free for all so we joined a huddle that had formed around a kiosk. When we finally got to the front a man tried to barge in front but Chelsea said 'no' and we were seen next. we bought a ticket to Hue for the 29th as we had read the trains can book up and it cost 703000 dong. It is quite expensive for us but we just can't face another overnight bus journey so soon after the horrificness that was the journey from the border to Hanoi. After paying for and collecting our train tickets we set of in search of the French district. It very soon became clear that our guide book was garbage and that the French district it pointed out was a collection of big French buildings on big wide traffic polluted streets and did not transport you to Paris like it promised. A word of advice to anyone wondering which guide book to take to SEAsia. Do not buy a rough guides one, they are crap in every way possible. We are hoping to find the real French district before we leave as our other guide book points to a different area of the city. After a wet and disappointing walk around the city we headed back to the Cathedral. The area around the cathedral is lovely. It is full of small streets that all meet at the cathedral and that are full of really small eating houses, cafes and shops. 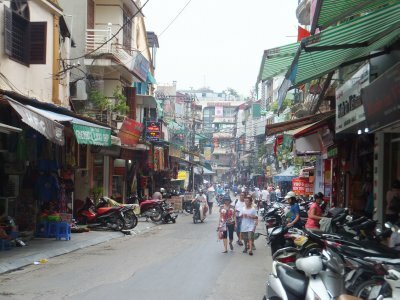 There is everything from small Vietnamese street food style shops to expensive boutique clothes shops and posh cafes. We went into a really nice cage overlooking the cathedral and had a drink to get dry out of the rain. We sat for a long time lingering over our pricey drinks, talking and watching the street. It was lovely. After we went into St Joseph's and were surprised by its interior. The outside is quite an unattractive concrete building but inside is really nice. Wood carvings, stained glass and high ceilings. It was nice and peaceful and we sat on one of the pews for a while admiring the architecture. It was a nice change to see a church and we haven't seen one for months. By this point it was late afternoon so we headed back to our guest house. We relaxed and showered, dried our rain macs and washed our muddy feet. For tea we walked to the old district. We are still shocked everything we go out at just how busy and frantic the city is. We walked around for a while overwhelmed and not sure where to eat and settled on a Bia Hoi place for a 5000 dong beer. We ordered several snack bits to share for food and it was gorgeous. We ordered crab spring rolls, steamed pork dumplings, fried chicken, and a sort of chicken stir fry an rice meal and we shared them all over several beers. It was a great, relaxed meal and the best way to enjoy Hanoi we think, sat on small tables on the street trying several different nit-bits. After 4 Bia Hois it was time to come home as we have an early start tomorrow. We have booked on a trip to Halong Bay. It has cost $25 but we don't think we would be able to do it ourselves for that price so we though we would book onto a stress free trip and let someone else take us. We are looking forward to it and have been since we were back in England so hope the weather is a bit better and we can actually see it. After recuperating in our room after our sleepless bus journey we were ready to go out and explore. There is only really one word to describe Hanoi, manic. We have not experienced anything like it, the streets are jam packed, there is a constant heavy flow of traffic which mainly consists of motorbikes. The sidewalks are apparently not used for people to walk on but for everyone to park their motorbike on, the small room that is not taken up by bikes is used by shops and small restaurants that spill out onto the streets. We explored the Old quatre today, the streets are narrow but this does not deter the traffic, junctions are like nothing we have ever seen, no one stops, there are no traffic lights, everyone just drives and somehow avoids each other. This makes crossing the road incredibly difficult as because no one ever stops you just have to go for it and hope they somehow miss you. All of this chaos is accompanied by the soundtrack of blaring horns. Each one seems loader and grates on you more than the last. Apart from this obvious shock, we have quite enjoyed our first day here. We went for a stroll this morning, and called at a street restaurant for brunch. We went to a restaurant that only serves 'bun cha'. There was no menu we were just given enough for two people. 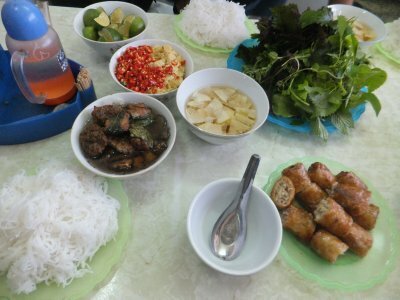 The meal consisted of BBQ'd meat and pork patties that come in a thin stew, another bowl of a pickled vegetable that we can not agree what it was, noodles, herbs, chilli, garlic and some crab spring rolls to share. We had enough food to feed half a dozen people but it was utterly delicious and we made a good dent in the giant portions we were served. This kind of stuffed us up and made walking around a bit too difficult. We took a break from the stress streets and headed to a small lake that sits in the centre of town. Apart from people trying to constantly sell us, fans, drinks, and food it was calmer and we took our time making our way around. After this we ended p going back to our guesthouse, we were still slightly tired from the previous night, the temperature had gone through the roof and we were totally stuffed from our epic brunch. A few hours later we were ready to brave the streets again. Tonight we decided to call for some of the super cheap beer we have heard so much about, and visit a street food restaurant in our guidebook. The streets do not quieten at night. It did not put us off though and we walked for around ten minutes to the first bar. 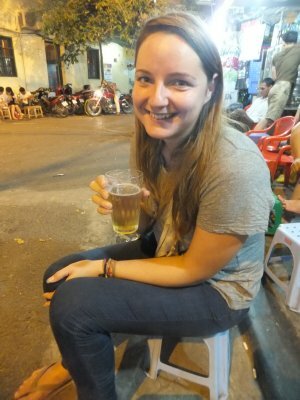 There is a beer in Vietnam that is called Bia Hoi. It is incredibly cheap, we bought two tonight at two different bars and they were 25p each. They seem to be a kind of home brew as they both tasted drastically different. we have read the beer is so cheap as it does not last very long so it has to be sold within 24 hours or so. That is fine by us. For dinner we called at a place called Bittek. It specialises in beef, so we ordered what we thought was beef steak and chips as this is what other people were eating. Instead we got a stir fry beef with veg and chips in a kind of gravy. It is not at all what we ordered but it was strangely delicious, and we can not think of why we have not though of stir frying chips before. After another super cheap beer it started to rain so we made our way back. Our first day has been slightly overwhelming but we can see the appeal of the city. For how busy it is it is still charming and the food going on todays evidence is spectacular. We plan to explore in the opposite direction tomorrow. We have not 100% decided on how long to spend here yet, but we do plan to do a day trip to Halong Bay before we start our trip south. The past two days have been extremely tiring making our way through Laos and into Vietnam. We started at 8am, checking out of our guesthouse and walking 2km to the bus stop in Nong Khiaw as we had read that the bus to Odomoxai left at 9m. When we got there it didn't leave until 11am so we had a few hours to wait. The lady behind the counter looked like we had spat in her face when we asked to buy the ticket as it meant she had to actually work and refused, saying we had to buy it closer to 11am. We decided to go for breakfast and crossed the street into what was named a restaurant but was actually someone's front room. They even had a Grandmother sat on a chair watching what looked like a Thai version of loose Women and chickens walked around all over. The family was friendly and we pointed to a sign that said fried rice and helped ourselves to some drinks from the fridge. After breakfast we went back to the bus stop and Chelsea made another attempt to buy the tickets as it was around 10.15am at this point. The lady refused again and had the same 'you spat in my face' look. At this point another tourist had arrived hoping to get on the same bus as us and was also flatly refused a ticket. We sat and waited until 10.45am and Liam decided to queue for a ticket. At this point a bus load of tourists had arrived and all wanted tickets for Luang Prabang and the bus driver told me to 'buy ticket now'. I politely advised him that Liam was in the queue and we had been trying to buy tickets for 3 hours. Actually getting a ticket took an age as all the people wanting to go to Luang Prabang had to be sorted first and there wasn't enough seats for them. By 11am we had got our tickets, our bag was on the roof and there were another 3 passengers sat on the bus. The bus didn't depart until 11.30am as we assume it was waiting for more customers. The public buses from Nong Khiaw are small minivans and its cost us 50,000 kip to go to Odomoxai. The sign at the bus stop does say 45,000 kip and we did point this out to the friendly lady at the bus stop but she just said 'no'. To get to Luang Prabang the sign says 40,000 kip but she was charging 50,000 kip for this journey also. The actual bus journey itself to Odomoxai was the worst we have ever encountered and we have been on some bad ones. The roads are the worst we have seen and the minivan just bounced along, throwing us around inside like nothing we have experienced. The road looks like it has been churned up to re-lay it and then has just been left. There are big pot holes, ditches, pools of water and big mounds of rocks. There was a lot of evidence of landslides and massive cliff edge drops. After 2 and half hours we stopped to stretch our legs at the weirdest place. There was a row of huts acting as shops but all they sold was cucumbers, there wasn’t even water for sale just cucumber after cucumber of different shapes and sizes. Needless to say we didn’t buy anything and set back off. We thought we might be past half way but we were wrong. The views on the journey were beautiful and the whole way was extremely rural, passing through tiny hamlets where pigs, buffalo and ducks roamed around. We didn’t arrive until 4.30pm and everyone on the bus was totally done in. We knew we would be getting back on a bus the following day so we found a guest house next to the bus station and went in. It was overpriced at 60,000 kip but we didn’t care and we unloaded out things and went out in search of some food. Finding a place to eat in this town actually proved quite difficult. The town is run down and everything was closed or boarded up. We found one noodle house that was open that had two tabled but when we walked in the owners looked at us in panic so we decided to try our look elsewhere. We managed to find one place that was open and that looked remotely like a restaurant. Inside was a group of men drinking beer and playing bowls. We sat down but no one came so Chelsea went up to the paying kiosk and ordered two of the only think she knew how to say in Laos, Kow Pad, fried rice and beers. The place turned out to be quite friendly and we were only stared at a little bit whist we sat and waited or our food. The food was nice and we drank our last beer Lao watching a group of men play a weird game of what looked like bowls. After we went straight to our room to relax in anticipation of another day spent on a bus on the roads in Laos. The next morning was an early start as the bus left at 8.30am. We thought we would have to get two buses, one to Muang Khua and one to the border but there is one bus that goes straight from Odomoxai straight through to Dien Bien Pu in Vietnam which we were thrilled by. We were even more thrilled when we saw it was not another god forsaken minivan but a VIP bus with fully reclinable leather seats. It cost 95,000 kip for the journey which is cheaper than doing it in two legs and much easier and comfier. The bus journey took all day but was so nice, such a comparison to the day before. Everyone got blankets and pillows and the seats were big and comfy. We took snacks on board as we knew it would take all day. The only downside to the bus as it acts as a sort of local bus between the villages in the mountains so it regularly stops to pick people up and to courier goods on. This mean that half way into the journey Chelsea had a travelsick lady from a village sat directly behind her vomiting throughout half the trip. When we reached Muang khua it stopped to let a few people on and Chelsea pointed out a man smoking a giant bong in the middle of the street. ‘Look at that man Liam with his giant bong….. Oh that’s our driver’. However apart from the vom lady and the driver on drugs the journey was carefree. When we arrived at the border everyone had to get off and be stamped out of Laos. Everyone just threw their passports at a man in an office who tamped them all without even looking at the pictures or the people. We then got back on the bus and drove a few kilometres through no man’s land and then had to be stamped into Vietnam. We handed our passports over and then had to be medically screened to make sure we didn’t have a fever and put all our bags through a scanner. We then picked up our passports and go back on the bus. It was simple and relatively quick. We arrived in Dien Bien Pu at around 4pm and weirdly drove past the bus station into a small muddy car park. We were then hounded by a bus driver and a man off our bus to get on their bus to Hanoi. We said we would like our bags and the man was quite forceful and aggressive. We got our bags and said we needed an ATM before we got on any bus but they insisted we should put our bags on the bus to Hanoi and they would take us to an ATM. Both us and another couple refused and walked off in the direction of the bus station. Once at the bus station we were hounded at all sides by bus drivers wanting customers. We managed to walk through and Chelsea asked a lady where we could find an ATM. She pointed in the direction and four of us walked together. After getting cash we had to face the bus station. We walked straight through all the men shouting at us and went straight to the lady in the kiosk. She tried to ask Chelsea what time she would like to go to Hanoi but we had been totally surrounded by shouting men so we couldn’t hear her. She wrote down a list of times and gave us a pen to circle the time we wanted. All the men were shouting the time of their bus for us to pick it like an aggressive game of bus bingo but she circles 17.30. We paid the 375,000 dong and all the men were shouting the time we had picked until the bus driver who owned the 17.30 came forward, giving us his card and showing where it departs. It was totally mental. After the ordeal we needed something to eat as hadn’t eaten a meal all day so went to the first place we saw, a mobile phone shop with a few tables and a menu of a list of different meats. Our friends from the bus joined us and Chelsea ordered chicken and Liam ordered soup. We both ended up with a noodle soup which was delicious and came with a selection of do it yourself herbs. We sat for an hour recuperating from the stress and then went to the bus station flashing our tickets at the men who heckled us to buy. We went to quite possibly the worst toilets ever and boarded the bus. We had never experienced any bus like it. It was an overnight sleeper bus and had three rows of reclining seats all of them with two bunks, one on the floor and one higher u. we were shown to some seats and got comfy. At first it was quite comfortable but it soon turned into a nightmare journey. The driver turned the lights out at 7pm so we couldn’t read and had to go to sleep but then he turned them back on at around 8pm and then didn’t turn them fully off till around 11.30pm. It was pitch black when we should have been awake but neon, multi coloured bright when we should have been asleep with karaoke TV on. We picked people us the whole way and the lights kept coming on and he continually beeped his horn. The driver flew around corners, braked suddenly and drove like a maniac so we almost fell off our top bunks several times. We had wondered why the entire floor was padded. We have had a slow few days in Nong Khiaw, pretty much the same as the pace of life in this sleepy village. On Sunday Chelsea was still not hundred per cent well so we had a lazy day, sat on our balcony, reading and talking. We walked over the bridge into the little town and down to the boat station as we needed to enquire about the times and cost of our onward journey. The public slow boat leaves Nong Khiaw for Muang Noi at 11am and 2pm, it takes one hour and costs 25,000 kip (less than £2.50). We then need to get a boat to the next town, Muang Khua where there is then a bus service into Vietnam. The boat up to Muang Khua costs 100,000 kip and takes 4 to 5 hours but it will only leave with a minimum of ten people. Otherwise you have to charter the boat and pay for the whole boat rather than just a seat. Since we don’t think there are even ten tourists up here, never mind ten tourists that have decided to all go to Vietnam on the same day we had to look into getting up to Vietnam a different way. We came back and sat in a little café with the internet to see how else we could get there. There is one other option, the bus. We can get the bus from Nong Khiaw to Udomxai at 9am for 45,000 kip. We then need to change and catch a bus from Udomxai to Muang Khua at 3pm for 35,000 kip. We then will have to stay overnight in Muang Khua and get the early morning 6am bus across the border to Dien Bien Phu, Vietnam….. easy…..yes. Once we had sorted out our plans it was time to go back to our busy schedule of relaxing. Yesterday we decided to go on a little explore. We had seen a sign in town that said that the Pathok cave was 3km away so we decided to walk it. It was a nice walk along the quiet road, up and down small hills into the mountainous jungle. The scenery around this area is stunning, huge green mountains with wispy clouds around their peaks, farmlands and the river. We have noticed that there are a lot of butterflies on Laos, all colours and sizes. It took us a while to walk it there in the blistering sun but we soon saw a sign next to the road pointing down the hill. Chelsea has broken her fourth pair of sunglasses back in Luang Prabang so she had to wear Liam’s giant cap and look like a tool. The sign said cross the river and rice paddy so we assumed there would be a little bridge. When we got down there we were wrong. There was a lady in a hut where you could buy tickets and a fast flowing muddy river. We stared at the river for a while and Chelsea said she didn’t want to go. The lady signalled to us that the river was only calf deep so we decided to buy tickets and go for it. (does this sound familiar….. an eventful day in Koh Phayam?). Tickets for the cave are only 5000 kip and we think it is definitely worth it. We took our shoes off and began to cross the river a little scared. As soon as we were in a man came over to help. It wasn’t calf deep but it wasn’t too bad, only the very bottom of our shorts got wet. The water was brown as it is wet season but the floor was shingle and thank god, not slimy mud. There was a little ladder at the other side to climb out. Once across the man started to lead us through a field and we knew he was our unofficial ‘guide’ who we would have to pay. It was extremely muddy as it was right next to a rice paddy and our feet instantly soaked through the grass and were dripping. It was only a short walk to the cave and then we climbed the steps into the rock. It was quite interesting and is where locals would hide in the war when the country was being bombed. Towards the back it was really dark. The man took Liam through and it opened into a massive, high cave. Chelsea stayed in the front cave as the man asked her if she wanted to see a giant and dangerous spider, she politely declined. After a look around inside the caves the man took us to another cave around the corner. The man again asked Chelsea if she wanted to see the spider and pointed to the cave so she stayed at the entrance. Liam climbed in, as there were no steps on this one. Inside was not as big as the first one but there was a huge nest of killer bees, a snake and a cave spider which they were eager to wake up and show him. He quickly exited catching a glance at the stalactites absolutely covered in giant bees. After another muddy walk across the field and another wade through the river it was time to head back. We gave the man 3000 kip for showing us around but he wanted 20,000 kip. Given that the entrance fee is only 5000 kip, we thought that 3000 kip was reasonable and said no. The walk back was hard as it was later and hotter and as soon as we arrived back into town we went straight into a café for a cold drink. The cave is worth a look and another 1km on there is a waterfall. Walking is easy but you can also rent bicycles and ride it if you have less time or fancy a change. 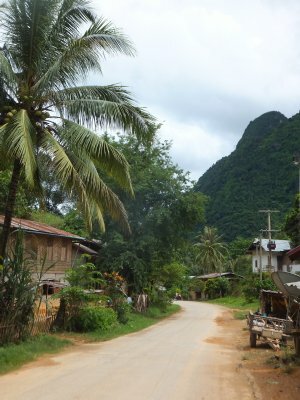 We arrived in the sleepy riverside village of Nong Khiaw around lunch time on Thursday. It was a bumpy yet short three hour drive from Luang Prabang. 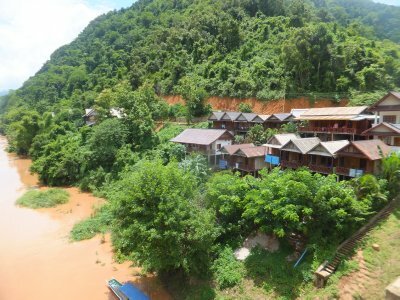 Our first impressions of the place were good, we were dropped off at a tiny bus station and had to walk around 2km to the guesthouses that are situated on the river Ou that runs through the village. The locals all watched us a we made our way, we noticed that there was very little catering for tourists, a welcome change after the tourist haven of Luang Prabang. When we got nearer the river we could see the selection of guesthouses that hug the river bank. All the tourist amenities (and there are not that many) are situated on the opposite side of the river to the main village. There is a small bridge to cross and then you can take your pick from a dozen or so places to stay. Most offer bungalows along the river, and a very nice man called us over as soon as we crossed the bridge to see his bungalows. Compared to the bungalow we stayed in on Koh Phayam it is luxury. It is a lot bigger, mainly sealed with a comfortable bed and a balcony overlooking the river, complete with hammock. The man offered it us for 50000 kip, the price being cheaper due to the low season and we accepted. Once settled in we went to explore our particular side of the river, there is not much there apart from the guesthouses, a handful of restaurants and a couple of tour groups offering treks. We called in a restaurant for something to eat and a beer and sat admiring the view of the large green rocky hills that surround the village. It is amazing scenery, especially when it rains and the clouds and mist come low around the hills. In the evening we went out for a meal and we had the restaurant to ourselves. although we have seen other tourists walking around they are few and far between compared every where else we have been in Laos. We imagine though this has a lot to do with the time of year looking at all the guesthouses there is for such a small place. In high season the place must be completely over run by tourists. Our meal was great and cheap, afterwards we took a bottle of beer Lao back to enjoy on our balcony. Since yesterday however Chelsea has been ill (we do not know what is up with us) so our exploring has been put on hold. Liam has been out a couple of times for supplies and something to eat whilst Chelsea has remained in the room. Luckily with the window open she can still see the view. She has improved today so we are hoping to go for a walk, if not we can spend another night or two here, explore and relax. 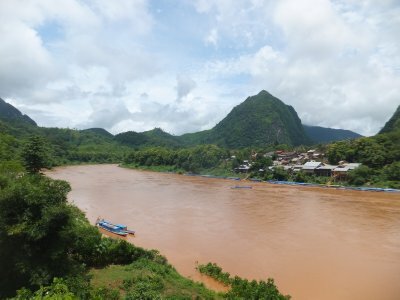 Our plan from here, is to catch a boat and go up river to another village Muang Ngoi, apparently an even sleepier village, spend maybe one or two nights there before carrying on up river to Muang Khua, the town from which we catch the bus to take us across the border in to Vietnam. We will be entering Vietnam on the 25th so have plenty of time to slowly make our way to the border.